We are pleased to see your interest in our up-coming Premium Commercial Project – ‘The LegendHeights’ with an assured return of 11% and leasing guarantee. 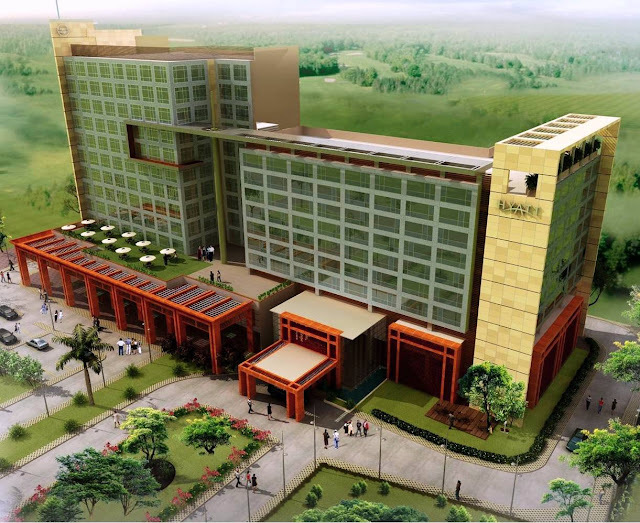 This oasis of serene development on the NH-8 is designed by renowned architects, La Arch Plan & Associates. In addition DDG USA, world famed Architects and Town Planner will ensure compliance to world class standards of Immaculate construction & inviting Mix Use Commercial Developments. Innovative group has successfully diversified itself into Manufacturing & Trading, Education , Investment & Finance, Hospitality and Health care and of course premium Real Estate and Infrastructure. The Real Estate and Infra division is coming up with SEZ in Navi Mumbai, Industrial City and Golf Township in suburbs of Gurgaon, Group Housing in Gurgaon and Innovative resort in Shimla. It has got ISO-9001 rating which shows the business strength and professional set up for the company. 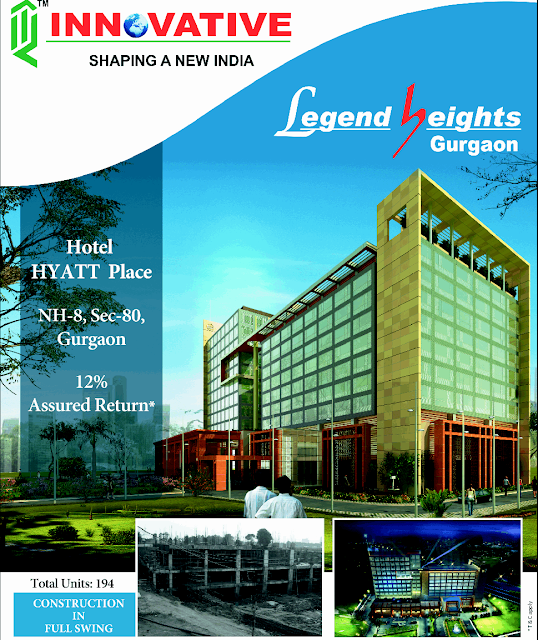 Two Side open Legend heights is being constructed in the emerging pocket in Sector-80, Gurgaon at the intersection of NH – 8 (270 metre wide) and Sector Road (84 Metre wide). The development is being done in approximately 3.35 acres with 70 % Green, open space. 3. Large number of Group Housing in a radius of 3 kms. 1. Mainstream Green Features which makes it 30% economical in terms of power consumption for the end user (Gold rating received from Environment and forest department). 2. 2.75 Lac sq ft. (approx.) of campus with offices, business Hotel and shopping Arcade. 4. Contiguous and scalable offices from 638 sq ft. to 2500 sq. ft.
Gurgaon Township in NCR having one of the best infrastructures in India is geared for a huge demand be’coz of the expected development in 3yrs down the line. 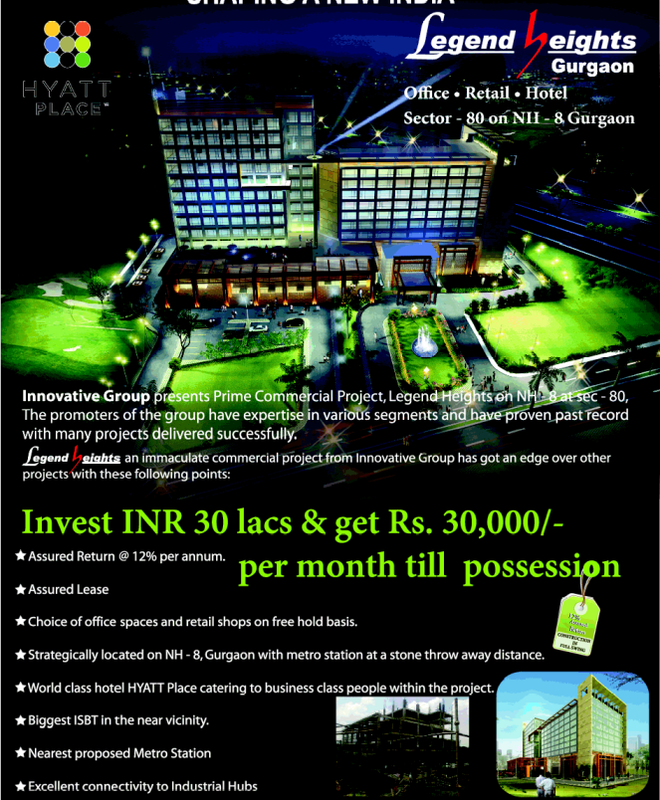 Not only in metros but in NCR also Companies prefer New Gurgaon because of better infrastructure and low rental value. This is why the companies like many chip designing companies, enabled companies prefer the location. The existing companies like Honda, Denso, Maruti Suzuki, Axis Bank, HDFC, and Many Export oriented companies are saying the success stories of New Gurgoan. Very true- Gurgaon is the hottest destination for the Investors in NCR.